This article is nominally about Venice, but it’s mostly about money, because money is truly the currency of Venice. There is a good reason for this. Venice is less a city than it is an ornament: pretty to look at, but not very functional. The same magnificent history that gave rise to the splendid patchwork of narrow footpaths and canals has also damned Venice to uselessness. Venice, with its 117 islands, hundreds of bridges and zero motorways, isnâ€™t especially well suited for anything but tourism, and the locals know it. Itâ€™s the biggest tourist trap in Europe, and possibly the entire world. Tourist â€˜trapâ€™ probably doesnâ€™t do it justice, actually. Itâ€™s a full scale ambush. I entered Venice on the bus from Mestre, Veniceâ€™s ugly sister city on the mainland. Mestre isnâ€™t glamorous, but the hotels are a lot cheaper and believe it or not, itâ€™s where most Venetians actually live. 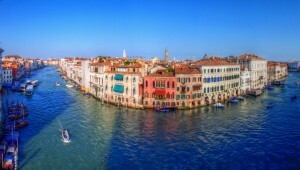 Smitten foreigners have driven the Venetian property market into the stratosphere, and the most sodden 1-bedroom apartment in town starts at well over a million dollars. Unlike New York or Berlin or London, where the rich hide in darkened cars and sprawling estates, in Venice there arenâ€™t any of either, and the Beautiful People are very much on display, sweeping through the Rialto in stoles and diamonds. The best thing about Venice is the Piazza San Marco, a huge courtyard at the basin of the Grand Canal. San Marco made the whole trip worthwhile: it is the jewel in Veniceâ€™s crown. Itâ€™s two acres of soaring arches and opulent architecture: the Dogeâ€™s Palace, the Basilica San Marco, the clock tower, and the sumptuous palazzo lining the banks of the Grand Canal. The place is in mint condition, and if you can forget that you are crammed belly to belly with thousands of Germans and Japanese and Americans, for a moment you can almost imagine that itâ€™s the fifteenth century again, and Venice is queen of the sea. In fact, in the Gallerie dellâ€™Academia (the old Venetian art school, now a world-class art gallery), there are beautiful paintings of San Marco in its prime, and scarcely a thing has changed in five hundred years. The Venice Lido is nice too. Itâ€™s a good break from the human chaos of the main islands, and the beach is excellent: clean, warm and unlike so many of Italyâ€™s beaches, completely free. 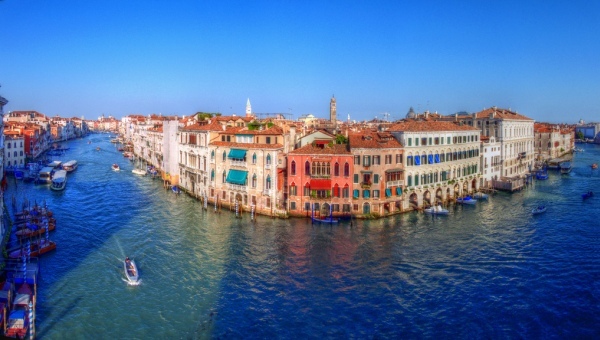 Venice is the worldâ€™s only pedestrian city, and an able-bodied human could probably traverse most of it in a mere few hours, but the canals are irresistible. The vaporetti (water buses) hold about two hundred people, cost 6.50 Euros and have all the leg room and glamour of sardine tins. Luxury travel in Venice is the gondola. A gondola ride takes about forty minutes and will probably set you back around eighty Euros. A lot of people seemed to enjoy sailing around in the sleek black boats with their plush cushions, and I was tempted to fork over, but ultimately a gondolier put me off. He seemed so jaded, cynical and frankly bored of wearing a stripy shirt and playing ferryman to nowhere that I decided to spare him the bother and walk it. Strolling around Venice is a cross between navigating the Matrix and shopping in a giant Renaissance mall. The same four things repeat themselves with chilling regularity: mask and costume stores, jewellery stores, restaurants and vendors of Murano glass. True Murano glass is made exclusively on Murano, one of the smaller islands, but because Venice is so full of swindlers, a lot of it actually comes from China. Venetian food can be a bit of a swindle too. One favourite tactic is tacking a 5% â€œcover chargeâ€ onto your bill. I asked my waitress at the dead-end Chinese restaurant what it meant, but she didnâ€™t know (she probably didnâ€™t know the meaning of her T-shirt caption either â€“ â€œBitch Paradeâ€). As for the food itself, itâ€™s not bad, but in other parts of Italy (Tuscany, Umbria) itâ€™s sublime, and probably cheaper. In Venice, a can of Coke costs 2.50 Euros â€œto goâ€, 3 Euros if they pour it into a glass, and 1.50 Euros to expel (the toilets are amongst the most expensive in Europe). On that note, contrary to the rumours flying around online, Venice doesnâ€™t smell bad. However, if you donâ€™t like suffocating crowds, middling food and contemptuous locals …you might be inclined to say that Venice stinks.